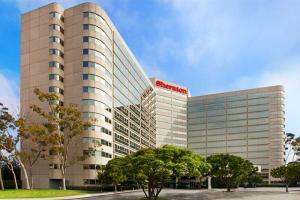 The Sheraton Gateway Los Angeles Airport Hotel is ideally located just blocks away from the airport and offering a complimentary shuttle to LAX. This convenient location is close to scenic beach cities, freeways, and public transportation. Each of the 802 luxurious guestrooms and suites have been thoughtfully transformed to provide the ultimate in comfort. Located just blocks away from LAX airport. Rendezvous Lounge - Drinks and snacks, The Brasserie - American buffet, Paparazzi Ristorante - Italian cuisine. California Science Center, Santa Monica 3rd Street, Venice Beach, Knott's Berry Farm, Aquarium of the Pacific, Griffith Park Observatory, Universal Studios.